The California parents accused of holding their 13 children captive have been banned from any contact with their alleged victims until 2021, a judge ruled this afternoon. The only kind of contact that would be permitted would be through either defense or prosecution lawyers. David Turpin, who was shackled in court, nodded when the judge asked him if he understood the court order. David Turpin, 57, and Louise Turpin, 49, accused of abusing their children for years, were arrested after the victims were found Jan. 14 at their home in Perris. One of their children — a 17-year-old girl — had clambered out of a window and used a deactivated cellphone to dial 911 for help, according to police. The Turpins allegedly forced the children to shower only once a year, shackled them and beat them routinely, Riverside County District Attorney Mike Hestrin said at a press conference last week. The victims weren’t released from their chains even to go to the bathroom, according to Hestrin. When found, they hadn’t been to a doctor in over four years and had never been to a dentist, he added. The 13 siblings — ages 2 to 29 — have since been hospitalized. All the victims except for the toddler were severely malnourished, Hestrin said, adding that the eldest victim — a 29-year-old woman — weighed only 82 pounds when rescued. He said another child, a 12-year-old, was the weight of an average 7-year-old. 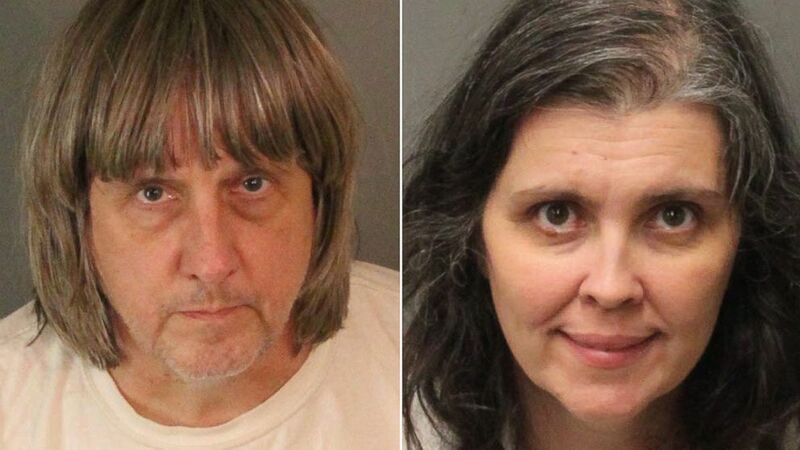 David and Louise Turpin have each been charged with 12 counts of torture, 12 counts of false imprisonment, seven counts of abuse of a dependent adult and six counts of child abuse. David Turpin was also charged with one count of a lewd act on a child under the age of 14 by force, fear or duress. They have pleaded not guilty. Anyone with information can call the tip line at the Riverside District Attorney’s Office at 888-934-KIDS.